Does This Sound Sick To You? What's Got Us Bummed Out? World Kindness Day—To Help Or Not To Help? What Side Of The Brain Are You? Browns Bowled Over The Patriots! 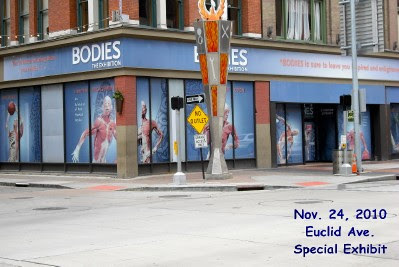 BODIES...The Exhibition is a must-see during its limited engagement in Cleveland. This striking Exhibition showcases real human bodies, dissected and preserved through a revolutionary process allowing visitors to see themselves in a fascinating way like never before. I Figured Out How To Get My Blog Header The Way I Want It! I really like my blog layout here which was customized for me, except I would have liked to be able to change my header and colors sometimes. Now, after three years of blogging, I finally figured out how to do it! I figured out to change the color of my layout background, I have to use HTML color codes and just replace the code for yellow with a code for a different color. The only problem was the I didn't know how to change the header to match. Now, I think I just may have found a solution. First, I finally discovered how to make a collage in Photobucket so now I can change my pictures from time to time if I want, and the color of the grid as well! I am so excited about this! Third, to get it as my header, all I had to do was go into the "design" tab in Blogger, choose edit header, pick the option to use picture instead of blog title and description, choose the shrink to fit box and upload my collage photo. It worked! I am so happy about this that I decided to make a video to let others know how to do it. The key is to find the "create collage" tab which is located under "Home" - "tools" - "image editor (click on "try it now"). I took notes on this for future use. We are both so thankful to have four days off together! 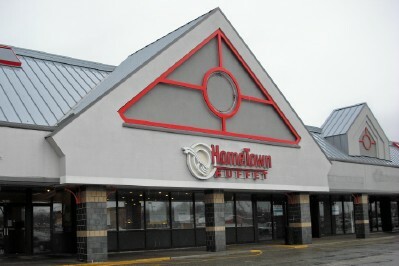 Since it was a cold rainy day, we pretty much stayed inside except to go to Hometown Buffet to eat. I spent the morning on the computer while Gerard walked the dog in the rain. We went at 11:40 a.m. and didn't have to wait in line, although the place was pretty full. Everyone seemed to be in a good mood. The salad bard was decorated nicely but I skipped that. I do like Waldorf salad, but I decided I wanted to save room for more desserts today. No one was at the salad bar so I bet I'm not the only one who was thinking that way. Over at The Old Geek, she explains "How To Publish Your Blog To Amazon Kindle." This is something I plan to do "some day." You have to load a screen shot of your blog and header so that's why I'm putting it off. This is something I want to get to one day though. Over at Worth's World: Black Friday Every Day I found out about www.buy.com. It has big sales every day with free shipping! This may definitely be worth looking into! Last Sunday, when my husband went to pick up our pizza from Casamels for lunch, the owner told him we were their best customer! We get it every Sunday unless we go somewhere and aren't home. Even then, we will generally get it on Saturday instead. Whose best customer are you? Thanks to the 40 readers of our blog who voted to help us pick a new title for our blog. As you can see, the winner is "Right Where We Belong." (The vote was 24-16.) I am not done with the header yet. It's a work in progress. If we are on your blog roll, could you please let me know if our new title is listed or not? I'm not sure how this works. It shows as "Zemeks" on My Funny Dad, Harry blog list and I'm trying to figure out how to fix it. UPDATE: I finally figured out how to do a collage on photobucket and made my own header with the pictures like I wanted tonight! I feel so good about this and am very proud of myself. Now, if I could only come up with some good posts! We wish everyone a very Happy and safe Thanksgiving. Try not to eat too much! I keep getting an annoying message from my Norton anti-virus whenever I use my Firefox browser lately (It comes up when I use IE too). It's a pop-up message in the lower right corner that says " performance alert--high CPU usage by Firefox" with a little graph. I have no idea what this is for, if I should be worried about it, or how to get it to stop. It's just annoying. I know Firefox uses a lot of memory. I really don't need Norton to keep telling me that. Anyone know what this is all about and if there's anything I could to do get it to stop short of removing my Norton protection? I ran the anti-malware last night like Kathy from the Junk Drawer suggested. It took two hours and it did find a couple infected objects; however, this box still pops up so I guess that wasn't it. P.S. "Right Where We Belong" is going to be our new blog title. Now I need to find someone to do a new header for me. I'd love to include pictures of us and our pets in it. I misread one of Mama Kat's Workshop prompts last week, thinking it said "Why are you bummed out?" but in fact it said "Why are you burned out?" So, anyhow, in a sense this post was inspired by her. I don't do much ranting on here so if you don't want to listen to my little annoying problems that are bumming me out, I understand. You have been warned. My DVD Project: I took off three days from work last week to put together a couple DVDs from my video clips and home movies but didn't see two of my movie scenes. One was of my dad playing with me in my jail tent. He was the prisoner trying to escape and I was the sheriff. I see the tent but am missing that part. The other was a Christmas scene of us kids playing with our puppet stage and marionettes. I'm hoping these were on a reel that just wasn't marked properly so I didn't have iMemories go ahead with the transfer. Overall, I am very pleased and look forward to getting my DVDs for Christmas. It's a lot of work though but kind of fun! Back to Work--Overtime: I loved having that time off and so of course am a little bummed out that I have to go back to work today. Although, the good news is that it's a short work week AND I am getting out early today, Tuesday and Wednesday so I can walk Abby at her normal time because Gerard has to work overtime those days so he can have off Thanksgiving and Friday. Naturally, that's got him bummed out. 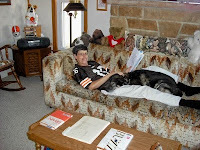 Football Sunday: Yesterday the Browns game was disappointing once again. With six turnovers, you would think they would win easily, but no. Our offense couldn't do anything. They lead into the 4th quarter but gave up a TD in the last few minutes and could not score after that. At least the Patriots beat the Colts in a close game! Yahoo Mail: My email was goofy for awhile last week but seems to be back to normal now. I am so glad! It wasn't filling in the TO: field automatically, the font was huge and it looked ugly and was annoying to me. When I forwarded an email, it appeared in a tiny box I had to scroll down to see and the recipient's message was formatted all wrong. I am participating in the Blog Jog that started yesterday and the Fantastic Followers Giveaways hop with my other two blogs so I will be off my normal routine this week. So, what's got you bummed out lately? Anything? Go ahead and share about your troubles in a comment. I know these are all minor things and I will certainly not dwell on any of them. I learned that I should take my library book along even if I am renewing it because if someone is waiting for it, I won't be able to renew it. Today I had to make two trips. I had Private Justice by Terri Blackstock for three weeks and didn't get to it. I really want to read this one so I'm going to re-order it since I couldn't renew it Saturday. Paperback Swap is donating new books to school in need when members turn in their credits. They buy a new book to donate for every credit turned in! I think that's pretty cool--donated 4 of mine. Thanks to iMemories.com, when I was looking through my old movies I discovered that my first Halloween costume was not a clown, but a rabbit! I finally learned the secret to applying Frontline to my pets. Do not push their fur aside until I see their skin, just go ahead and push the applicator down into their fur. Moving their fur seems to be disturbing to them and gives them a warning. By just pushing the applicator down through their fur, they don't know it's coming I guess. 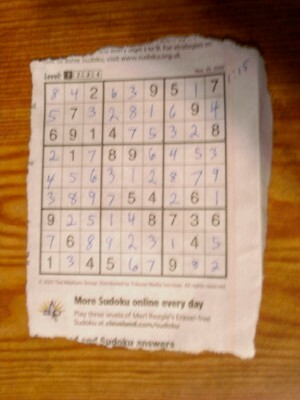 I did my first Sudoku puzzle! 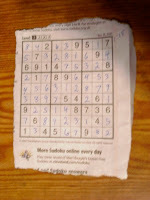 It's just logic but you have to look for the squares that can't be any other number. Click to find more Friday Fragments. Check out our three giveaways: Drawing is Nov. 20 for Hard Cache by Charles Neff (Suspense/mystery) and Drawing is Nov. 25 for You Already Know How To Be Great (Self-help) by Alan Fine and drawing is Nov. 28 for My Funny Dad, Harry. This is in response to Mama Kat's Writer's Workshop prompt: List 10 reasons why you do or you don't drink coffee. This is why I do not drink coffee (Gerard doesn't either). 1. Never started, so no reason to start now. 2. It's hot--I don't like hot drinks! 3. You have to make it--I'm lazy when it comes to the kitchen. 4. I don't like the taste of mocha--isn't that how coffee tastes? 5. Don't want to wash the cup or mug. 6. I don't even like the smell of it. 7. The percolator scares me--I made it once when I had guests for a home decor party. 8. I take after my dad who never drank coffee. 9. I don't like coffee stains on any of my things: no coffee = no stains! 10. It's dangerous, my pets or us could get burned! 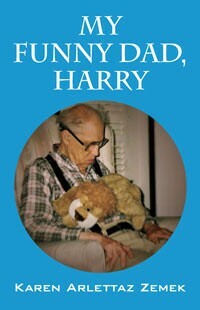 I'm Having A Book Giveaway For "My Funny Dad, Harry"
If you like reading my blog, I'm pretty sure you would also like the book I wrote in memory of my dad. I am having giving away two autographed copies along with a DVD to followers of my other blogs: "My Funny Dad, Harry" and "Grab A Book" From Our Stack." All you do to enter is just leave a comment on either or both of those posts. If you don't follow either of those yet, feel free to start and go ahead and enter the giveaway. Hopefully while you're there, you'll take a little time to poke around and see what all is there. I share how our relationship changed as he got older and I became his primary caregiver. It's a book about love of family, including his cats, the funny things he did, and how God helped me through the hard months following his death. I hope someone would like to get this! Who Has Significantly Impacted The Course Of Your Life Other Than Family? November 13 is officially designated as “World Kindness Day.” Now, I try to be kind every day and since I read One Simple Act—Discovering The Power Of Generosity by Debbie Mecomber, I try to be even a little kinder. However, last Thursday on my way to the bus stop, at the corner of my street was an elderly gentlemen who called me over saying he needed my help. I noticed his car was parked in front of the Mower repair shop with the trunk open. I asked what he wanted but he just kept telling me to come over and help him. He shuffled along as he walked which reminded me of my dad. I said I was on my way to catch a bus and again asked him what he wanted. He just repeated to come over and help me, it’ll only take a minute. (1) I should be willing to sacrifice my agenda and time to help someone. (2) Why won’t he tell me what he needs? (3) Women get abducted all the time, this could be a ploy to get me into his car. (4) What if I go over and he throws me into the trunk? (5) I might miss my bus, it could come any minute. (6) If I don't help, I'm not being like the "good Samaritan." Do You Know What Tomorrow Is? Over at The Prairie Maid I learned from a badge on her sidebar that November 13 is World Kindness Day. This is the fist I've heard about it. We should all be a little kinder than usual! Did you know some elevators don't have any buttons for the floors on the inside? I just came across some like that this week. The buttons for the floors are on the wall next to the elevator on the outside! The security guy asked me if I needed help when he saw me standing there, gawking at it getting ready to take this picture and told me they are common in New York, but were just installed in this building about six months ago. 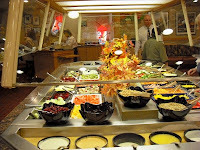 Last week when we went out for breakfast to Hometown Buffet, I was disappointed to learn that they didn't have any bread pudding. That's my favorite thing to get there at the breakfast buffet. Apparently, at least the one by us is discontinuing it. Boo hoo. Over at Comedy Plus this week I found a link to a cool site that tells you what happened the year you were born. All you do is plug in a year and it prints a bunch of things that happened then. It's pretty cool. In 1953, the top selling movie was Peter Pan (my hero--I never wanted to grow up either). Yesterday one of my attorneys shared that he took his dog to the vet for surgery. It has skin cancer that keeps returning. He said bulldogs are prone to skin cancer. Very sad the dog and his family. Second, I remember one day he sang “The Battle Hymn Of The Republic” in school as a solo one day. I was so impressed and never forgot it. Every time I hear that song, I think of Tarin and wonder if he remembers me. I even remember his LAST name! If you happen to read this, Tarin, I’d love to hear what you are doing now. Do you remember a unique classmate? What was so unique about them? 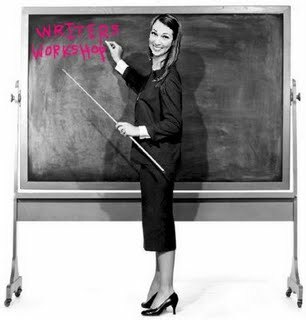 This is part of Mama Kat’s Writer’s Workshop in response to the prompt: “What made them so interesting? Remember a unique classmate from your past? Write about him/her” which was inspired by writingfix.com. This meme is from Beaded Tail. It actually has several sets of questions and then you are supposed to answer them all and add another four, but well, it would just be too long and boring so I'm only answering the ones from Beaded Tail and then adding four of my own. Feel free to answer them and include a link back. Also, let me know in the comments if you do this so I can come see your answers and questions. 1. If you had the power to fix anything that's wrong with this world, what would it be. I would remove selfishness from the world completely and replace it with empathy, compassion and a genuine desire to help all living things, thus wiping out poverty, greed, crime, unsportsmanlike behavior and domestic violence and abuse. 2. What's your favorite indulgence? Pizza! Please don't ask me to give up eating pizza. Sunny, warm, doing something really fun with my husband, having free time to blog and be with my pets, eating well and getting everything done that I wanted to do. 4. If you could fly off tomorrow to any destination for a week, where would you go and why? I would decline. I want to stay right here at home with my husband and my pets. I really would not want to leave them for a whole week to go anywhere that I would have to fly to! I think being separated from your family would be the hardest part of being in the military and am so glad I never had immediate family in the armed forces. 1) When do you feel like being alone? 2) If you could change one thing about your life right now to make it better, what would it be? 3) What is your favorite TV show now and what was one you liked way back when? 4) If you could be any animal, what would you be and why? And for the tagees, don't worry, I won't tag anyone who doesn't want to be tagged so I'll let anyone and everyone who wants to play along to do so. Hope someone does! Please help us choose a new name for our blog by voting in our poll at the top left sidebar. Also, have a book giveaway you may want to enter at Grab A Book From Our Stack for "You Already Know How To Be Great" by Alan Fine. The drawing is Thanksgiving Day and there will be five winners! The brain builds a double memory of the content of every thought, one on the left side of the brain and one on the right . 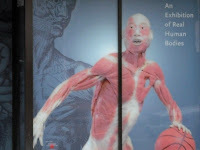 . . both sides of the brain take part in every activity, just from different perspectives. You are a logical and orderly person. You have a system for almost everything in your life. (This is absolutely true about me. I have a system for everything and a place for everything. You like to stay busy, and it's important that you stay on task. You prefer to do one thing at a time. (I do like being busy--I thrive on having a project of some sort going. I generally do only one big project at a time; however, I multi-task on small things. You are also good with words. You love to read, and you've been known to write well. (I feel I am better at writing than speaking, guess that's why I enjoy blogging so much. I do like to read now although that wasn't always the case. I think just because I'm older now, I sit around more so have the time for it. I really never read for pleasure until after I married Gerard. Click the link below to take the quiz and share your results in the comments. Gerard yelled at the Patriots while I cheered for the Browns Sunday. I loved seeing the Browns play so well with very few penalties. They look like a whole new team out there that really knows what they are doing with Colt McCoy as quarterback. A rookie who has taken control and manages the game very well. He is very athletic and poised too. He completes most of his passes, does not throw interceptions and can run as well. It's so nice to have a quarterback to doesn't get sacked every other play too. The Browns are looking really good right now with smart coaching, a good mix of players that are doing their job. The defense, offense and special teams once again all worked well. I really think the team is . . . dare I say on the way to getting into the playoffs this year. Even the games they lost they played well and had the lead into the 4th quarter. Watch out, here come the Browns! I think they will get more respect now that they beat two top teams in a row. It's so much more fun to watch when they keep possession of the ball for larger amounts of time. They even are making 3rd and 4th down conversions. I am really enjoying the football season this year! Normally, Gerard would be happy too but not when they beat the Patriots. We started watching together, but he went and watched in the basement the second half. It's time to pack a shoe box to send to a child in a third world country through Samaritan's Purse Operation Christmas Child! I finally learned the best (and easiest) way to make use of Blog Frog. First, I finally put the widget to my "neighborhood" on all three of my blogspot blogs and discovered that if I sign in to Blog Frog before I go visiting other blogs, then whenever I see questions on others widgets that I want to answer, all I have to do is click on the question and it takes me right there! Much easier than trying to find my way around on Blog Frog. How about joining my neighborhood and either starting a discussion or answering some questions? I'd love to get this going but need your help! I was very surprised when I went through my Facebook messages last Saturday to discover Ryan M. considers me to be one of six people other than his family who "significantly impacted the course" of his life. WOW! What a great feeling to hear this! Read more about it at One Simple Act Made A Big Impact that I posted here on Monday night. I saw my first ever two-faced Halloween pumpkin this week over at Show Me Mama. I like the boy one better. It was a cold, snowy day. Gerard had his Camaro which was no good in the snow. He gets home from work before I do, but somehow I got home before him, maybe I had the day off. That I don’t remember. I do remember how anxious I was to see him pull into the driveway. 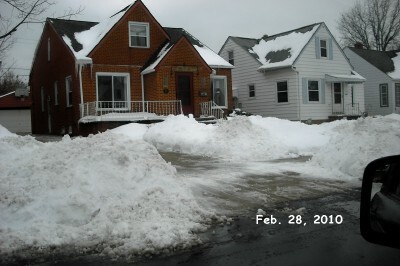 I don’t even remember what month it was. All I remember is how I kept praying that God would keep him safe and help him get home soon while pacing back and forth. Bad thoughts kept going through my head like I prayed for his safety at work and he broke his ankle anyway. What if he’s in an accident? What would I do without him now? I hated these thoughts so replaced them with songs of praise to God instead. 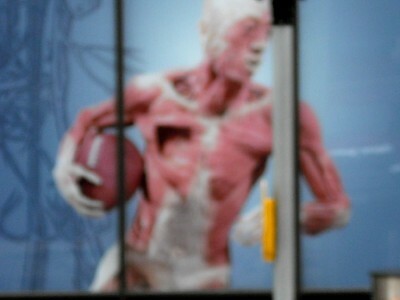 I opened the front blinds so I could see farther down the street and stood by the window watching for him. Winter storms can be extremely nerve wrecking. Every time I saw headlights coming down the street my heart would jump in my chest hoping it was him. Then the car kept on going by and I’d pray some more. Finally, a car came and turned into our driveway. I was ecstatic and so relieved to see my husband that I thanked God for getting him home safely and met him at the front door, welcoming him home. One of the best things I look forward to when we retire is not having to go anywhere in bad weather. 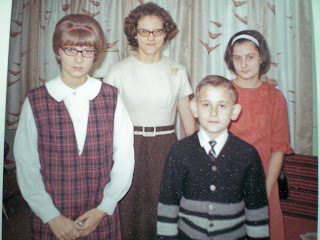 This is in response to Mama Kat's Writer's Workshop prompt: A time you feared for the safety of a loved one. In choosing my favorite read for October, this one came close simply because I learned so many interesting things from it. Who Switched Off My Brain by Dr. Caroline Leaf was a real eye-opener for me. The beginning read like a textbook but to me it was pretty fascinating to learn how the brain works and how interrelated our thoughts are to our emotions and our physical health. God has told us in His word what things to think about and this book presents some scientific research that explains why, supporting. Did you know the heart is more than just a pump to circulate blood? It works closely with the mind! I found this to be a fascinating read and it has definitely made me more aware of my thoughts. Yesterday, the devotional from Joel and Victoria Osteen was on this very subject. Below is an excerpt from it. Karen: We don't even really know each other, but she single handedly changed the entire course of my life. One random act of kindness to sponsor me to go on a simple trip set off a chain of events that continue to impact me. Because of the people I met on that trip - which I never would have taken had she not randomly and anonymously sponsored - resulted in me meeting friends for life, finding the school I would attend (which would allow me to meet Tom, see above), and my potential mate. Quite an impact." This got me thinking of the people other than family who have significantly impacted my life and I thought I would write about them in another post. Although some have gone to be with the Lord, others are still living and it may make them feel good to know they have made a significant impact on my life. You don't always get to know what God will do with one simple act of kindness shown someone or what it will mean to them. It sure is nice though when you do get to know about it. Thanks, Ryan, for letting me know! Keep showing kindness to others. I try to do a kind deed for someone every day, some days, even more than one! I like to surprise people. Debbie Mecomber's book, One Simple Act--Discovering The Power Of Generosity is all about impacting others through generosity. (click the link to se my review of it.) It's a great book! I highly recommend it! For best posts of the week, check out Saturday Samplings. Our Favorite Reads For October: "Dewey's Nine Lives" and "Room"
Room by Emma Donoghue is an unusual story about the love between a mother and child. It is told Jack when he is five. His mother was kidnapped at 19 and has been kept locked up in a one-room shed for seven years. 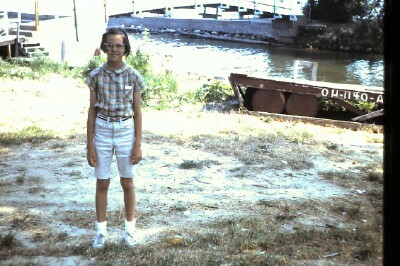 She was raped by her kidnapper, Old Nick, and had Jack. The only world Jack knew was the one room for the first five years of his life until one day, Ma felt he was old enough to help them escape. I enjoyed all the things the mother did with Jack every day. They had a TV and a few books for entertainment. They never got outside until they tricked Old Nick. Jack was a hero and the rest of the book was about Jack learning about real life outside of the room and his mother readjusting to living again. I think the mother did an amazing job with Jack under the circumstances. I liked that it has a happy ending and think any mother would enjoy this book. Vicki Myron is back with more stories about Dewey and other stories about people who have had their lives touched by cats in her book, Dewey‘s Nine Lives. This is just an outstanding read. The stories about Dewey are good and the other stories are really good too! I enjoyed this book so much! So, welcome back, Dwey, and the friends he brought along. This book will make my top 10 for the year for sure! I highly recommend to anyone who enjoys reading about pets, people‘s everyday lives and cats. Visit Grab A Book From Our Stack to see what we are currently reading and all of our book reviews.